It’s no secret that we have unwavering affection for Starbucks drinks, especially those included in the Rainbow Secret Menu. You know, like the Pink Drink from earlier this month. But now Starbucks has outdone themselves with a new addition to the secret menu: the #OrangeDrink! This is not only a full burst of vibrant color, but a giant mouthful of summer citrus-flavor as well. 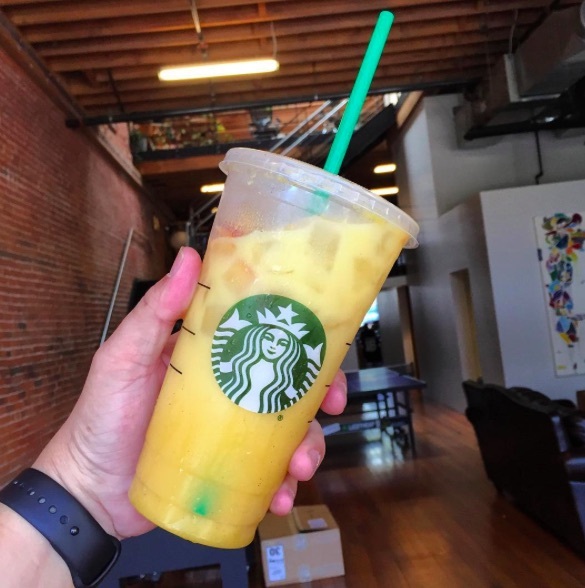 Foodbeast was able to track down a Starbucks store manager, Eric Olson, who spilled the beans on the ingredients in Orange Drink, so that baristas at Starbucks everywhere can recreate it. So, here’s the skinny: it’s made up of orange mango juice, two scoops of vanilla bean powder poured over ice and topped with coconut milk. The drink can be enjoyed shaken or fizzed, whatever you prefer. We have one word for that: YUM! REFRESHING! Okay, two words. Unsurprisingly, Orange drink is already a hit with Starbucks fans. When it’s 100 degrees outside, this drink is a necessity. Starbucks really is getting creative, so we can’t wait to see what new drink they come up with next. In the meantime, it’s all about the Orange Drink. Literally. Okay, we know that summer officially started a couple of days ago, but it feels really official now with this perfect summertime drink. Thank you, Starbucks! Always looking out for us and delivering things we want, before we even know that we want them. BRB. Heading to Starbucks to experience delicious summer in a cup.